The forces of right-wing politics are resurgent; immigration is regularly discussed on the airwaves and the phrase “foreign workers, coming over here, taking our jobs” circulates obstinately. Those on the political left seem implacably divided. It could be 2017. It is, however, 1977 as depicted by David Edgar in Destiny. This Play for Today, which he adapted for television from his acclaimed theatre production, analyses how and why the far-right National Front was becoming a genuine political force in 1976-77. Edgar portrays the intersection of politics with human lives; his Brecht-influenced dramaturgy is accompanied by a close attention to British places and voices. Part one of this three-part essay will consider Edgar’s background and Destiny’s history as a stage play and will place the television play in its historical and televisual contexts. Part two will consider the television play’s casting and production and its reception by critics, BBC management and audiences. Part three will analyse this neglected entry in the eighth series of Play for Today in relation to debates over docudrama forms and naturalism. The essays will analyse its status as an adaptation, with close readings of how emphases were changed in making the play for television. The television Destiny will also be analysed as a contribution to debates on national and class identity and for its representations of a range of British political ideologies in the 1970s. David Edgar, whose father Barrie had worked for the BBC, was born in 1948 in Birmingham. In his early career, he worked on investigative stories at the Bradford Telegraph and Argus, including the story of the Poulson scandal; while he worked there, he lived in the “immigrant slum” of Mannington.2 In 2005, Edgar stated that his interest in the far right had begun in 1972, when he reported for the Argus on meetings of the Yorkshire Campaign to Stop Immigration. Anticipating situations in Destiny, the “leader was a rather dapper ex-Conservative councillor, who presided benignly over chaotic meetings in which films were shown upside down and without sound.”3 Edgar’s statement that this group, which later merged with the National Front, addressed many “real needs and some real fears” anticipates the rare empathy that Edgar later captured in his play. By 1977, many of the 40 plays he had written were in the Soviet-inspired agit-prop style: “consciousness-raising theatre which privileges political message above art” and which “can be performed in any location.”4 These included short plays on Concorde and the motor-cycle industry.5 Edgar’s first work for television was The Eagle Has Landed (1973), a satire on the Apollo Space Programme for Late Night Theatre.6 Critic Benny Green enjoyed this “eccentric little pasquinade” with its lampooning of lunar coverage but baulked at the “undisguised hatred” Edgar showed for “Americans, technocrats and lumpen proles”.7 Also for Granada, Edgar wrote I Know What I Meant (1974), which dramatised Nixon and the White House tapes,8 and for the BBC’s Play for Today strand he dramatised his stage-play Baby Love (1974).9 His next work for BBC1, prescient of 2017 news, was A Crisis in Gibraltar (1975), co-written with actor-writer Ken Jones for the BBC ‘Schools and College’ morning strand Colour Focus: “Britain and Spain clash in the simulations room of the Pentagon.”10 In the same year, Edgar worked on two topical, live plays: the co-written Censors and his own The Midas Touch (1975).11 These plays were for The Eleventh Hour, a series of half-hour dramas on which each writer began work on Monday morning, leading up to the broadcast on Saturday night. Edgar’s dramaturgy was influenced by television drama documentaries; he has expressed admiration for Leslie Woodhead’s unit at Granada, and has extensively analysed Granada’s Three Days in Szczecin (1976), ATV’s Death of a Princess (1980) and Granada’s Invasion (1980)12 as three key exemplar television texts in this style.13 In his guise as critic, Edgar much preferred fellow radical playwright Trevor Griffiths’ Brechtian approach in Comedians to his more individual-centred approach in his popular series Bill Brand (1976).14 Edgar argues “that dramatic fiction can uniquely illumine certain aspects of public life and the dramatic power of drama-documentary lies in its capacity to show us not that certain events occurred […] or even […] why they occurred […] but how they occurred: how recognisable human beings rule, fight, judge, meet, negotiate, suppress and over-throw”.15 These ideas are influential for his approach in writing Destiny as a drama that illuminates public events and that shows how people are rooted in and create history. On the play’s London release, Edgar argued: “plays won’t send people out to the barricades, What they can do is ultimately give people new images with which to understand the world. But only in connection with their own experience.”35 Therefore, Edgar used settings that would be within people’s experiences: pubs, an antiques shop and a meeting hall. The play is set in the constituency of Taddley, a fictional town but rooted geographically: “to the west of Birmingham”.36 The play text opens with scrupulously dated quotations from the Conservative Party manifesto (1950) and Peregrine Worsthorne (1959),37 and there are references to left-wing Labour Party agent Paul’s antipathy for political figures Roy Jenkins and Reg Prentice.38 Edgar sets the pivotal Act 1 Scene 6 on 20 April 1968; Drumont gives Cleaver the newspaper containing coverage of Enoch Powell’s Birmingham “Rivers of Blood” speech, which Cleaver reads out.39 The non-naturalistic verse narratives given to Colonel Chandler, Major Rolfe and Turner and Khera all begin with adverbials of time: “In ’48.”, “In ’47.”, “In ’48.” and “In “58.” These verses explain the characters’ relocation back to England and place their lives against a specific historical canvas. It reflects Brecht’s dramatic form of epic theatre with its “sequential scenes rather than continuous narrative” for the purpose of “alienation over illusion, and political urgency”.40 The “Voice” opens the play by narrating events in the past-tense in typical epic theatre style.41 However, Edgar is also keen to enact events on stage, such as the picket-line and election count confrontations. In the February 1974 General Election, the National Front fielded 54 candidates and gained 76,865 votes. 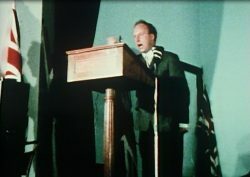 In an edition of ITV current affairs series This Week in September 1974, senior NF figures like Martin Webster and John Tyndall claimed that “we have a completely clear conscience” regarding violence.42 The programme undermines this statement by narrating the activities of Webster, Tyndall and Jordan with such groups as the Greater Britain Movement in the 1960s and recalling the assault of Kenyan president Kenyatta in 1964, which left Webster imprisoned. Tyndall’s predecessor John O’Brien speaks damningly of Webster: “The perfect example of the school bully grown large and grown adult, who has kept his school bully methods”. NF rhetoric attacking “30 years of incompetent government” anticipates opinions spoken by characters in Edgar’s Destiny. The supposedly “moderate” face of the NF, as associated with Roy Painter, a Monday Club Tory defector from Tottenham, is echoed in the play by characters such as Mrs Howard and Major Rolfe. This Week provides some coverage of campaigning by Leicester NF candidates, but the programme’s main focus is on delineating the history and characteristics of the party’s leadership. In the October 1974 election, they gained 113,843 votes from an enlarged roster of 90 candidates. Destiny was not the only 1978 television programme about the National Front. In contrast to the earlier This Week documentary, the World in Action edition The Nazi Party focused primarily on the Party’s current stances and activities, addressing the party’s focus on anti-communism, anti-Semitism and racial purity.55 The documentary provides a history of the party from its formation in March 1967, and explains how its tactics had to change following the Racial Discrimination Act. (In 1965, the Greater Britain Movement had openly argued for gas chambers. By the late 1960s, inspired by Enoch Powell’s popularity, they primarily emphasised the issue of immigration.) The programme repeatedly emphasises the party’s violence, stating that there have been “25 attacks in the last year in Leeds alone”. 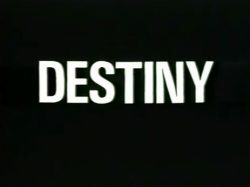 The programme names members and candidates who have convictions for violent offences; two were convicted in January 1978, within two weeks of the broadcast of Destiny. Admiration of Hitler is said to be common among “some”. In a chilling premonition of the killing of Jo Cox MP, one person “told police he’d wanted to assassinate a public figure”. 1978 seemed a crossroads for the left, as expressed not just in Destiny but in published fiction and non-fiction. In June, Melvyn Bragg’s novel Autumn Manoeuvres captured discontent with the post-WW2 consensus and the longer-term rightwards trend, through the microcosm of one Cumbrian constituency.60 In October, Jeremy Seabrook published a comparable, but more pessimistic, “humanist meditation in documentary form” What Went Wrong? Working People and the Ideals of the Labour Movement.61 Bragg’s engaging novel portrays 1978’s tangible economic and political upturn for Labour, with its alternative-future story depicting Callaghan’s Labour winning the autumn 1978 election that “Sunny Jim” famously never called, and the Cumbrian MP Jimmie Johnston narrowly retaining his seat. Although the novel gives the Workers’ Revolutionary Party an important role, it does not mention the NF, in contrast to Seabrook who interviewed working-class NF supporters. Further important context for Destiny was provided by the Grunwick dispute (1976-78). The left backed striking Asian female workers at a photo-processing plant,70 against their boss George Ward, who was soon backed by right-wing allies such as the National Association for Freedom. 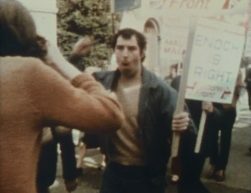 The dispute escalated into a major confronation between left and right, with the SWP on the left and the NAFF on the right seeing the strike as a proxy war for the political direction of the UK. In May and June 1977 respectively, the picket line was joined by three government ministers and two coachloads of miners from Barnsley led by Arthur Scargill.71 Violence occurred, with PC Trevor Wilson injured and featured on many newspaper front-pages on 24 June 1977, such as the Daily Mail, whose headline described this as “A BLOT ON BRITAIN”.72 This is widely credited as a turning-point in the dispute, providing ammunition for the political right, and was followed by the famous tactics of the NAFF with their “Saturday midnight coup” when, in July, they posted the entire backlog of Grunwick’s mail themselves.73 This backlog had built up in the factory as the postal unions had refused to deliver the company’s mail in solidarity with the striking workers. This incident has been mythologised by those involved as an individualist, somewhat Ealing comedy-esque, rebellion against authority, which in the late 1970s was seen as the trade unions and a liberal legal establishment.74 Despite the 1977 Scarman Report,75 which largely vindicated the picketers’ case, the trade union side’s loss became inevitable – due to divisions in the workplace itself and the loss of public sympathy, influenced by the prevalence of the PC Wilson image in the national consciousness. 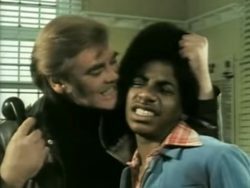 That times were changing was shown by the end of the successful series The Black and White Minstrel Show.80 The challenging of television’s casual racism became more marked following the broadcast of Destiny. 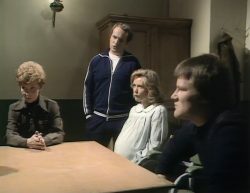 In March 1979, Open Door, which had previously given a platform to Jim Merrick, gave a late-night slot to CARM (the Campaign Against Racism in the Media), whose programme ‘It Ain’t Half Racist Mum’ forcefully criticised racist representations on television.81 None of this cultural counter-attack affected the stridency of the NF; Michael Salt was quoted in 1981 as saying that if the NF came to power, they would repeal the 1948 British Nationality Act, “and all coloured immigrants […] together with their dependents and descendants, will revert to the status of being aliens and will be liable to be repatriated. We make no exception in the case of footballers or anyone else.” Electorally, however, the National Front faded: in 1983 they stood in 60 seats and gained 27,065 votes and in 1987 stood in one seat and gained just 286 votes. Fiddick discussed the perception that the single play on television had become seen as safe and lacked major new writers beyond the 1960s-nurtured school of John Hopkins, David Mercer and Dennis Potter. This perception of a more conservative turn is supported by John Hill, who has argued that BBC management “reduced” the number of radical, left-wing plays following the controversial Leeds United! (1974) and Jim Allen, Ken Loach and Tony Garnett’s Days of Hope (1975).92 Fiddick argued that greater risks were now being taken again, with writers like Poliakoff, Mary O’Malley, Barrie Keeffe, Mike Leigh and David Edgar being recruited from the theatre world to write for the new series of Play for Today. Its first two plays, Stronger than the Sun and Robin Chapman’s Come the Revolution (1977),93 hint at the increased political content that would be enabled by the appointment by Head of Plays James Cellan Jones of a new producer, thirty-one year-old Margaret Matheson.94 When asked about the style of plays she wanted, Matheson said that “I want to do public plays, not domestic ones. Loud plays you could call them – drama you couldn’t miss the subject of, that would stir us up a bit.”95 Alongside commissioning new works she acquired the rights to adapt existing plays, from the zeitgeist-capturing Abigail’s Party96 to Destiny. Edgar’s play was an adventurous choice, a play that would indeed “stir us up a bit”. This essay continues in Part 2 and Part 3 (posted 2 June). Originally posted (Part 1): 31 May 2017. 14 July 2017: addition of eleven extra sentences on Open Door; standardisation of endnotes by completing first names in citations; correcting Matheson quotation; minor typographical corrections; punctuation standardisation.